If you're a Travel Channel fan and also have an iPad or other iThing, you might want to take note! DOWNLOADS OF THE UPDATED 'TRAVEL CHANNEL LAYOVER GUIDE' AVAILABLE ON THE APP STORE SM STARTING TODAY, NOVEMBER 15! New Version of the Popular App To Be Updated Weekly Coinciding with Original Episodes of "The Layover With Anthony Bourdain"
CHEVY CHASE, MD (November 15, 2012) Travel Channel wants to make planning your next excursion more accessible…and adventurous! 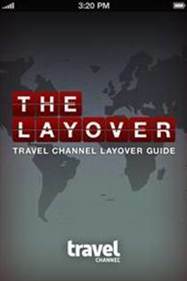 Starting today, November 15, iPhone and iPad users can download the FREE Travel Channel Layover Guide on the App Store. Featuring Travel Channel's video, photography and expert advice, the updated guide provides a unique and off-the-beaten-path perspective on hotspots and local favorites in different cities around the world…and this time for free! The first version of the app, which launched in March 2012 for $1.99, debuted as the #1 Travel download on the App Store. 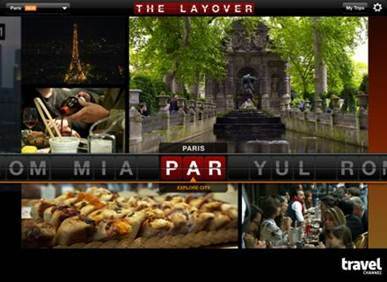 The updated version unveils an inside look at Chicago, coinciding with the premiere of season two of "The Layover with Anthony Bourdain" on November 19 at 9:00pm ET/PT. · Spotlights 10 new cities as featured on the new season including Atlanta, Dublin, New Orleans, Paris, Philadelphia, Sao Paulo, Seattle, Taipei, Toronto (each new city will appear concurrently in the app as that episode airs). · Users will be able to edit recommended times at any point-of-interest – restaurants, bars, stores, museums, etc. – presented in the app. Their personalized layover timelines will adjust accordingly. · App users will be able to opt for advisories, as well as tune-in reminders for upcoming TV episodes. · In-app navigation will be reworked to facilitate browsing within this expanded content set. "In-app" web browsing will make it easier for users to navigate from app content to any point of interest web site, and back. TRAVEL CHANNEL (http://www.travelchannel.com) is a multiplatform travel lifestyle brand with the core mission of providing inspiring and compelling programming that takes viewers beyond their everyday destinations, making the unfamiliar familiar, whether it's around the world or around the block. A dual feed network that is also available in HD, Travel Channel is the world's leading travel media brand, and is available in over 94 million U.S. cable homes. Owned and operated by Scripps Networks Interactive (NYSE: SNI), Travel Channel has offices in Chevy Chase, MD, and New York, NY. Scripps Networks Interactive (NYSE: SNI) also owns and operates HGTV, DIY Network, Food Network, CookingChannel and Great American Country.